See the list of group members to contact individuals directly. 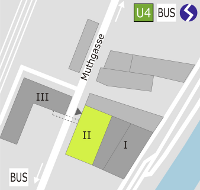 The institute building in Muthgasse is labelled ‘II’ in the schematic drawing above. A choice of excellent public transport connections (e. g., tube U4 Heiligenstadt) is displayed in the interactive online map of the City of Vienna or via Google Maps, where the institute is marked by a red symbol. The transport operators offer a convenient online route planner. From the airport (Flughafen), the easiest route takes one by regional train (S-Bahn or CAT) to the central station Wien Mitte. There, change to the tube and use line U4 all the way to Heiligenstadt. The journey time from Wien Mitte is about 9 minutes, the trip from the airport to Heiligenstadt takes a total of 36–44 minutes. From station Heiligenstadt it is then but a brief 7-minute walk to the institute. The institute also has an underground car park. There is a fee if you stay for more than two hours. If you are driving along the Donaukanalbundesstraße, take the Döbling exit; coming from the Donauuferautobahn, use exit Nordbrücke (note that this is the second exit in an adjacent pair of slipways!). The car park entrance is in Muthgasse, building ‘II’. The institute will be happy to advise on accommodation in Vienna. Both the tourist bureau and the city of Vienna provide general information for visitors.